A recent conversation with an omnivorous friend who is transitioning to a more plant based diet, inspired a new series - the Omnivore Challenge! I thought it would be a fun way to challenge both myself, as well friends/family/readers to try and 'veganize' some of their favorite dishes. 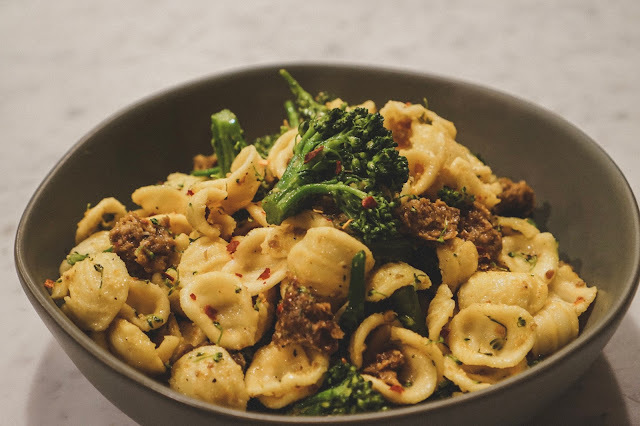 My first shot was this Orecchiette pasta with italian sausage and broccoli rabe. This is a super simple, classic Italian dish, that would typically use pork sausage and parmesan cheese. 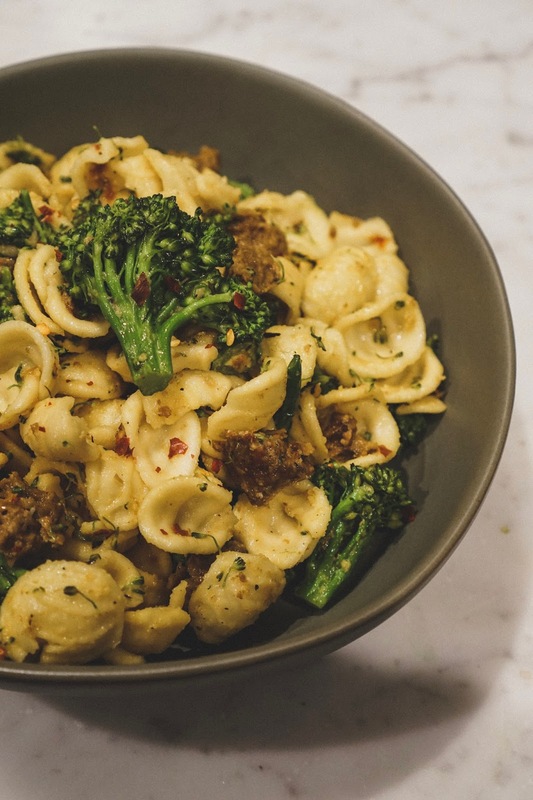 To create a vegan version, I simply swapped in Tofurky's Vegan Italian Sausage and good ole nutritional yeast! You may have seen the recipe on my Instagram story, but I wanted to get it up on here for those who missed it. I love this for a super quick dinner, that can seriously be whipped up in 15 minutes! Leftovers were perfect for lunch - I even added a little bit of my favorite tomato basil sauce to switch it up a bit. Test this out with your omnivorous friends and tell me what they think. Also, please comment below or on my Instagram any favorite dish you'd like veganized! Boil a large pot of salted water. Before cooking the pasta, blanch the washed broccoli rabe in the boiling water for about 3 minutes. Remove from water and immediately rinse in cold water, so stop the cooking. Set aside. Boil pasta according to package instructions, erring on the side of al dente, as the pasta will receive extra cooking time in the sauce later. While pasta is cooking, add olive oil and garlic cloves into a large saute pan. Bring up to a medium-low heat, to gently cook the garlic and infuse the olive oil. After about 5 minutes, add the chili flake and crumbles sausage. Stir to combine and allow to brown slightly. As the sausage browns, roughly chop the broccoli rabe and add to the olive oil sauce. Stir to coat. When the pasta is finished cooking, drain and add directly to the saute pan along with the sauce. Add the nutritional yeast and stir to combine. Taste for salt, add as necessary. Plate up a big bowl and enjoy!